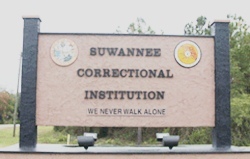 Suwannee Correctional Institution and Annex is located in Live Oaks Florida. It is a level V facility that can hold 1,502 male adult inmates in a closed, medium and minimum security setting. The Annex can hold approximately 1,342 inmates. Vocational opportunities at Suwannee correctional include plumbing and fire sprinkler systems as well as personal computer support services. The chaplains office offers religious education and worshiping services, as well as programs aimed at fatherhood and personal growth. Inmates can also earn an adult basic education and earn their GED. You can visit an inmate once you have filled out a visitors application and had it approved. Visiting is on Saturdays and Sundays from 9am-3pm. Visitors must register when they arrive at the institution, registration begins at 8:15am and ends at 2pm.